Thursday January 14th 1897 It snowed more last night. Will here busy about the place all day. I has sewing when not busy with house-work. We heard last night Henry Bird had rented a house in town. Friday January 15th 1897 I was busy with the work all morning. We had early dinner and went to town. I did a little shopping and went down to call on Mrs Main and in next-door to see Amelia Grimms baby. We came home early. I sewed all the evening. Saturday January 16th 1897 By the time I had my morning work done Elmer & Ida came We had a pleasant day with them. They brought up the turkey I bought to keep. It rained a part of the day I was busy doing mending all the evening. 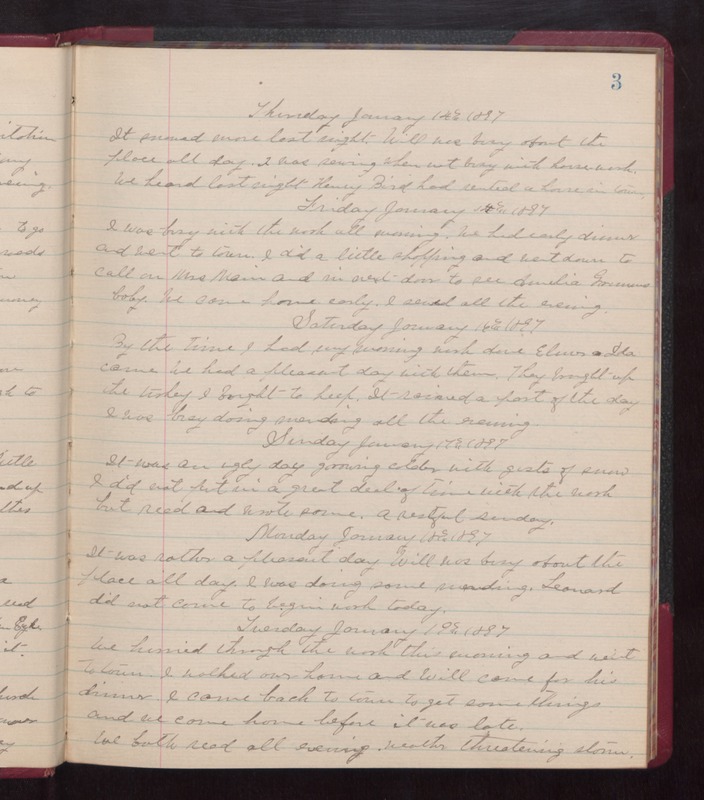 Sunday January 17th 1897 It was an ugly day growing colder with gusts of snow I did not put in a great deal of time with the work but read and wrote some. A restful Sunday. Monday January 18th 1897 It was rather a pleasant day. Will was busy about the place all day. I was doing some mending. Leonard did not come to begin work today. Tuesday January 19th 1897 We hurried through the work this morning and went to town. I walked over home and Will came for his dinner. I come back to town to get some things and we came home before it was late. We both read all evening. weather threatening storm.